A deal between Fifa and Lionel Messi’s sponsor Adidas will prevent the Real Madrid superstar from using the award logo on his products if he triumphs on Monday. Cristiano Ronaldo has been dealt a blow ahead of next week’s Ballon d’Or announcement as details emerge of a deal between Adidas – the main sponsor of Lionel Messi – and Fifa. Under the terms of the agreement, Adidas enjoys exclusive rights for the promotion of Fifa Ballon d’Or merchandise, while Nike, Ronaldo’s main sponsor and that of fellow leading candidate Franck Ribery, does not possess the same privilege. It means the Real Madrid forward, who is favourite to land the prize, will be unable to make money from the award in the same manner as his great rival and current holder. “These official partnerships are the reasons why we can use the official award name within promotional activity and therefore, by the same token, why Nike could not,” Ben Goldhagen, Senior PR Manager for Adidas UK and Ireland, told Goal. 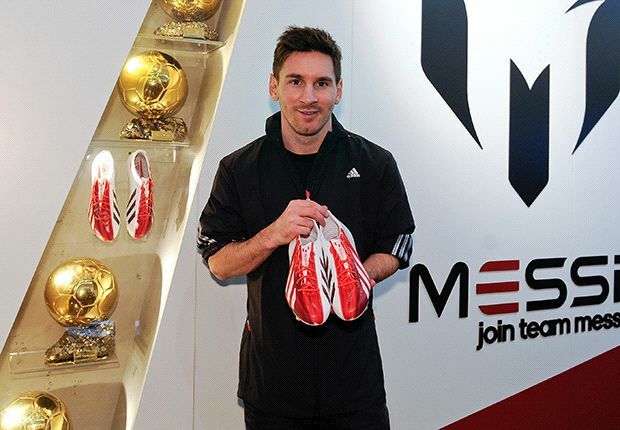 Adidas produced a special edition f50 boot to commemorate Messi’s fourth consecutive Ballon d’Or win last January and plans are afoot for a similar campaign in spring in the event of a Messi win in the 2013 voting. “We would certainly look to repeat that approach next time around,” Goldhagen said. Ronaldo and Nike, by contrast, would not be entitled to market such a Ballon d’Or-inspired boot in the event of a victory for the Portugal captain. Adidas is one of Fifa’s six World Cup ‘official partners’ and has supplied balls and equipment for every tournament since 1970. In November, the 43-year partnership was renewed to cover all Fifa events through 2030. The previous deal was renewed in 2005 at a cost of around €30m per year. The new agreement is believed to be worth significantly more. Adidas predicts that its sales in the football category will reach record highs of €2 billion in 2014, up from a total of €1.7bn in 2012. Much of that sum will depend on Messi and his exposure in football’s great untapped wilderness – America. Marketing plans for the Argentina captain could be made all the more fruitful were he to win the Ballon d’Or. The company has already launched a Messi range of clothing and footwear and the Argentina international is only the second footballer after David Beckham to have such a line tailored by Adidas. Nike and Fifa declined to comment. This entry was posted in FOOTBALL and tagged ADDIDAS, FIFA, Messi, NIKE, Ronaldo. 5 Reasons You Should Stop Caring What People Think.